Nicole Graves, still reeling from her kidnapping in London, is struggling to balance work at L.A.’s most prestigious law firm and a long-distance romance with her English lover. Things go sideways when she tracks down a missing colleague. The murder of the firm’s in-house investigator, his mysterious wealth, and his inexplicable bequest make Nicole a target for the police, the paparazzi, and the killer. When Nicole’s life takes an unexpected turn, she uncovers evil and corruption among the city’s most powerful people. The fast-paced mystery unravels against the backdrop of L.A. with its peculiar mix of balmy weather, the celebrity-crazed media, and a corrupt power structure hidden by the veneer of glamour and wealth. 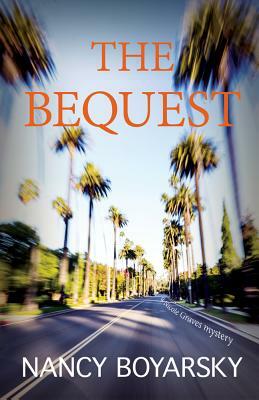 The Bequest: A Nicole Graves Mystery is Nancy Boyarsky’s second novel, following The Swap, which is the first of the Nicole Graves mysteries. Before turning to mysteries, Nancy coauthored Backroom Politics, a New York Times notable book, with her husband, Bill Boyarsky. She has written several textbooks on the justice system as well as articles for publications including the Los Angeles Times, Forbes, and McCall’s. She also contributed to political anthologies, including In the Running, about women’s political campaigns. In addition to her writing career, she was communications director for political affairs for ARCO. Readers are invited to connect with Nancy through her website at nancyboyarsky.com.